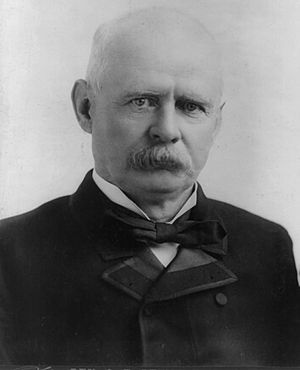 Adlai Ewing Stevenson (October 23, 1835 – June 14, 1914) was an American politician. He was Vice President of the United States under Grover Cleveland, and ran for United States President and several other political offices, but lost. He was also first assistant Postmaster General and a member of the United States House of Representatives, as well. His grandson of the same name also was a notable politician and writer. Another grandson, McLean Stevenson was an actor. His other grandson was Illinois Senator Adlai Stevenson III. Adlai Stevenson I Facts for Kids. Kiddle Encyclopedia.